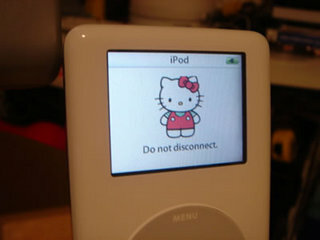 Over in the O'Reilly Mac Devcenter, Wei-Meng Lee provides a selection of cool iPod tips to get you through the holidays. Do iPod users switch to Mac? iPod sales make plenty of money for Apple. But do Windows iPod users actually switch to Mac in significant numbers? A recent column in the Wall Street Journal explores that question, and finds some evidence of switchers. Some time ago a couple of my old MSFT MacBU buddies posted (here and here) about how you can programatically control iTunes for Windows. This is an amazingly powerful capability. Anybody know of cool projects that are using these iTunes/COM interfaces? The inevitable 80 Gb hard disk is coming, which paves the way for an 80 Gb iPod. More, more, more! If you buy the new U2 box set at the iTunes Music Store, you'll get a "digital booklet" along with all the music. The booklet is delivered as a PDF, and it goes right into your iTunes library, although it opens in Preview or Acrobat Reader. Kirk McElhearn has a discussion here about how iTunes 4.7 handles non-music files. Hey, how did they do this? Slashdotted! (I always wanted to say that ;-) ). Thanks to Tony Williams for the nice review on Slashdot.